Beyond borders, beyond cultures and beyond continents. Share your experience, increase your performance! "The most remarkable aspect of our participation in the Global CCU Forum and Awards 2015 was the chance to learn from the experience of other participants and members of the jury. All throughout the forum, we were very keen to share good practices with renowned corporate universities from different cultural backgrounds and varied industries, as well as to identify opportun ities for improving our programs and corporate education actions. Needless to say, being elected the best overall corporate university was an extraordinary achievement that represents a landmark in our efforts to promote and deliver quality education." "This is a great honor and privilege for us to receive this reputable GlobalCCU Award. 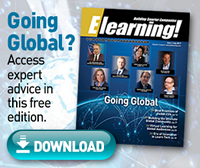 With corporate universities being a growing trend world-wide, the role of GlobalCCU in sharing and highlighting the best practices is very important now. The international recognition of Sberbank Corporate University’s achievements is the result of intensive and proactive work by the whole Sberbank team in developing the culture of learning organization and the world-class Corporate university to support Sberbank's vision of its human capital as key source of its sustainable competitive advantage. This year the other GlobalCCU prize-winners were also very prominent, and for us its is quite a responcibility to be the first representative of Russian business to be awarded by GlobalCCU and we will make all efforts that this high-caliber international professional community will continue to recognize developments and innovations at Sberbank CU on our way forward." "Representing DAU, the 2013 GlobalCCU Best Overall Corporate University, and as the President of the 2015 Awards committee , I felt that this year's GlobalCCU Award recipientswere truly Global! Many great organizations were represented, and the award winners were diverse , impressive and represented the best of the best in corporate universities ." "Of particular benefit to me were the benchmarking sessions where we were able to share the details of the many best practices demonstrated at this premier event! Additionally , the opportunity to meet and network with winning organizations was invaluable for I obtained many great ideas on how to improve my own corporate university especially in the area of digital technologies." "Regarding participation in the Advisory and Judging Committee in Awards process: I valued the awards process very much as I was able to meet and interact with highly experienced peers in our profession from around the world , learn about new and interesting practices from among our applicants, and take time out from day to day execution of my own work to reflect and consider new approaches with fresh insights . Additionally, the Awards event was very enjoyable, in a lovely venue with a good mix of pageantry and ceremony with friendly humor and warmth. The benchmarking sessions brought together award winners and thought leaders from Corporate Universities from a round the world to discuss and reflect on new ideas, challenging common issues, and how they are building on established best practices to address the needs of new business goals and new learning styles of our employees. I was impressed by how the award winners have ta ken very fresh approaches to long-standing challenges with great results, and will be taking these learnings back to my own team to discuss." … the aggregator of Corporate Universities on a global scale! The unique global organisation highlighting and gathering Corporate University professionals worldwide, and shaping the Corporate University profession through GlobalCCU CU Certification and the GlobalCCU Forum and Awards. Join your peers from more than 50 countries today in our complementary global community, the GlobalCCU Platform. Please fill in the application form and accept the terms and conditions. Uni Brad (Brazil), GlobalCCU Best overall Corporate University 2017 Gold Award winner, celebrated their outstanding achievement with the CEO of Banco Bradesco. Igor Fernando Ferreira, McDonald’s – Arcos Dorados (Latin America) Best Corporate University - Leader of the Year 2017. 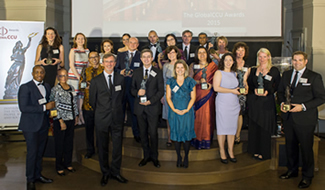 2015 GlobalCCU Awards ceremony in Paris, France gathered Ambassadors, diplomats and journalists from across the globe to honour the award winning Corporate Universities. 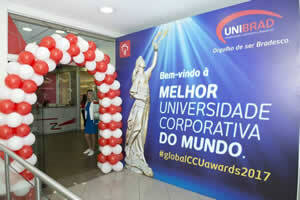 UniBB (Brazil) GlobalCCU Best overall Corporate University 2017 Gold Award winner. 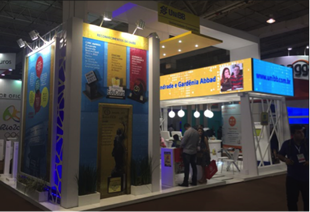 Below UniBB had a stand at Conarh (Human Resources National Congress), the largest human resources event in Latin America and second in the world. Visitors learnt about the success of UniBB in the stand here in photo. DAU, Defense Acquisition University, the best overall Corporate University Gold Winner 2013, organized a ceremony in front of the entire university for presenting the GlobalCCU Award.The trophy has been displayed in the Pentagon to all the senior leadership. 2013 GlobalCCU Awards ceremony held at the Microsoft HQ in Paris, highlighted winners from outstanding Corporate Universities from five continents. Hugo Pena Brandão, Executive Manager of Banco do Brasil Corporate University (UniBB) welcomed Annick Renaud-Coulon in Brasilia on 17 and 18 March 2016 for filming video lessons for the UniBB Portal. © 2018 Univencis. All rights reserved. The format, design, content and arrangement of this website constitute a trademark of Annick Renaud-Coulon. GlobalCCU is the first truly global community of corporate university professionals, beyond borders, beyond cultures, and beyond continents.